Afghan Khorasan Kabab House is not an easy destination to find as it is located in the next alleyway to Naif Mosque close to Naif market in Deira, Dubai. Despite being hard to find, the restaurant is quite popular and visitors can learn about it from any local shop keeper once they reach Naif market. The reasonably priced menu of Afghan Khorasan Kabab House consists of awesome dishes like Irani kebab, humous, curries, pulao, white rice, soup, salads and lot more. Due to its varied menu people from almost all communities of Dubai visit the place, but Arab clientele dominates all, as they are often found on this site in their traditional dresses. These customers bask in the delicious food of Afghan Khorasan Kabab House in unique settings that includes muddy walls, raised carpeted floor, chandeliers, glossy gold roof under which seating arrangement on the floor is also obtainable. This confined haunt serves traditional Indian, Afghani, Arabic, Middle Eastern and Pakistani food. Therefore, it is equally famous among all the communities of Dubai, who keep this place full of beans and relish the different delicacies of this restaurant, which are prepared under the supervision of master chefs. The restaurant is family friendly and it serves afternoon tea as well, which guests can enjoy in its outdoor seating as well or they can avail the take away service to bring the food or other varieties of this bistro to their home or any other private place. The regular opening hours of this venue are from 10:00 am to 1:00 am and it opens daily to serve breakfast, lunch and dinner. Behind Al Ghurair Masjid, near Naif Souq, Deira - Dubai - United Arab Emirates. Baniyas Square Metro Station 2 is 500 metres away from the Afghan Khorasan Kabab House. 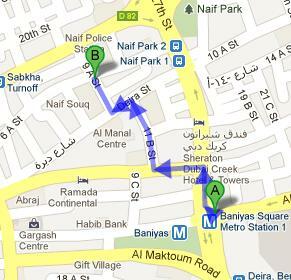 On foot a person can reach this bistro from Baniyas Square Metro Station 2 in about 7 minutes. To do so person should head in the northwest direction towards 27th Street from this metro station and then make a slight right turn onto 27th Street. After that patrons should turn left onto Al Burj Street that will lead them to a right turn that goes onto 11 B Street from where they should turn left onto Deira Street and make a right turn onto 9 A Street to reach the destination that is just a few steps away. Naif, Police Station stop is the nearest one to the restaurant and buses numbers 4,10,11A,13,13A,13B,13D,64,64A,C5 have stop here. 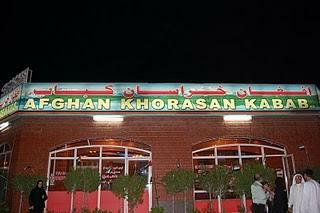 The restaurant is just about 150 metres away from the Afghan Khorasan Kabab House and on foot this journey can be completed in about 2 minutes, if he or she heads in the southwest direction on Sikkat Al Khail Road/D 82 towards 9 A Street from this bus station and then make a slight left onto 9 A Street in order to get to the destination. Follow directions on map.